The Bismarck Tribune’s graphic of the proposed route through what essentially is the Gettysburg of the Northern Great Plains, the Killdeer Mountain Battlefield from 1864. Historical actors involved included Sitting Bull, Inkpaduta, Gall, Sully, among others. The Center for Heritage Renewal at North Dakota State University is preparing a submission for the North Dakota Public Service Commission hearing in Killdeer on Sept. 4. 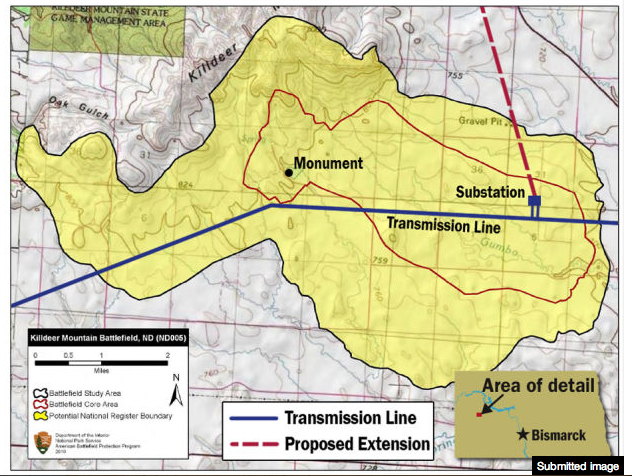 The subject is an electrical power transmission line and substation proposed to be built, by Basin Electric, in the core area of the Killdeer Mountain Battlefield. The topic has been covered by North Dakota media, starting yesterday. The Center for Heritage Renewal was established to identify, preserve and capitalize on the heritage resources of North Dakota and the northern plains. One of the center’s objectives is to assist state agencies, private organizations and the people of the state and region in generating prosperity and quality of life from heritage resources. Another objective is to provide expertise and action in the fields of historic preservation and heritage tourism. The center recognizes the efforts of Basin Electric to support regional development but is concerned that the environmental impact statement for the project takes no cognizance of the historical significance of Killdeer Mountain. The center has signed a contract with the National Park Service to survey and study the Killdeer Mountain Battlefield, which the park service has identified as a significant Civil War-era site in North Dakota. The contract is with the American Battlefield Protection Program of the National Park Service. Killdeer Mountain was the chosen ground on which Dakota and Lakota fighters, including Inkpaduta and Sitting Bull, confronted the Northwest Expedition, commanded by General Alfred Sully, on July 28, 1864. This was the largest military engagement ever to take place on the Great Plains of North America, and a crucial episode in the Dakota War of 1862-1864. This entry was posted on Friday, August 30th, 2013 at 6:29 pm	and tagged with Alfred Sully, Basin Electric, Center for Heritage Renewal, Dakota Wars, Gall, Inkpaduta, Killdeer Mountains, Metcalf Archaeology, North Dakota State University, Sitting Bull, State Historical Society of North Dakota, Thomas Isern, US-Dakota Wars and posted in Uncategorized. You can follow any responses to this entry through the RSS 2.0 feed.